Helen has extensive experience spanning both state and local governments, and is Chair of the Board’s Education, Quality and Effectiveness Committee. As Member of the Legislative Council for the Koonung Province electorate, Helen served on the Parliamentary Standing Committee for Education and Training and chaired the Parliamentary Review of the Body Corporate Legislation and Regulations, culminating in the Owners Corporation Act 2006. Elected Councillor in the City of Whitehorse from 1997 to 2002, Helen served as Mayor from 1998 to 1999. Whilst a Councillor, she was a member of numerous Council Committees including the Audit Committee. Helen also served on the Whitehorse-Manningham Library Corporation Board for three years. 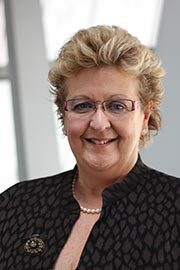 Helen has held numerous Board positions; her previous ones including with Centre for Adult Education, Box Hill Hospital, Family Access Network, Myeloma Foundation of Australia, and Deakin University Council, serving on its Finance Committee and as Deputy Chair of the Planning Committee.